A well-equipped property in the pines that's full of fun and games! Adventure Lodge is an appealing cabin in the tall pines just 2.2 miles or 7 minutes from the downtown Courthouse Plaza. This well-equipped lodge is set up for fun with lots of games, sports and recreation for your amusement and pleasure. This property has three bedrooms, two baths and sleeps eight guests. The Master bedroom has a California King bed, flat screen cable TV, overhead fan and en-suite bath with a walk-in shower. Decorated with Fritz Scholder prints and lots of windows it provides both relaxation and entertainment. The second bedroom has two Full beds one of which is a futon. This bedroom overlooks the party backyard so you can always look out to see if you are missing out on any mischief. It also has an overhead fan and flat screen TV. Inside the closet are board games and puzzles for the whole family to enjoy. The third bedroom has a Queen bed (flat screen TV and overhead fan) and is across from the hall bath with a tub shower combination. Adventure Lodge is where your party vacation begins. Do you like ping pong? How about pool, air hockey, darts, horseshoes and volleyball? This property has both a game room and large back yard that sports an outdoor kitchen with sink, fridge, propane grill, covered bar and overhead fan. Several seating areas give you lots of choices. Do you want to be near the outdoor gas fireplace? By the putting green? Close to the ping pong table? 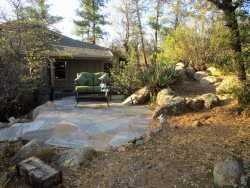 Surrounded by huge Ponderosa Pines this outdoor space is inviting and cool even on the warmest days. If you must go inside you may appreciate the comfortable living room with huge flat screen TV and gas fireplace. Choose among the large movie collection or select a book to read. This inviting area has many soft brown leather chairs and couches and opens on to the back yard with a large slider. The cheerful dining room has a large 6 seat table right next to the modern kitchen with granite countertops. The kitchen has a gas stove and dishwasher. All dishes and linens are provided… you only need to bring food and clothes. The washer/dryer are convenient for longer stays and high speed Internet keeps you in touch with the world. Central heat and A/C? Of course! The front yard is fully fenced and quite large. This way your dog can have a wild adventure of his own. The large porch has a loveseat and chairs if you want to drink coffee or sip wine and wave to the neighbors. It also comes with some friendly bears (wood statue) and has a loveseat swing under the Oak tree for day dreaming and naps. The laundry room, game room, (hey! Are you a Cardinals, Suns or Wildcats fan?) kitchen and dining room have tile floors and the rest of the house is wood. For a quick weekend stay or several months time... Adventure Lodge is the perfect place for your Prescott get-away!